Atomic displacements, homogeneous electric fields, strain. Such computations are realized when one of the input variables rfphon, rfelfd or rfstrs are non-zero, which activates optdriver=1. You are supposed to be well-familiarized with such calculations before starting the present tutorial. See the input variables described in dfpt varset and the tutorial Response-Function 1 and subsequent tutorials. You will learn about the basic implementation of parallelism for DFPT calculations, then will execute a very simple, quick calculation for one dynamical matrix for FCC aluminum, whose scaling is limited to a few dozen computing cores, then you will execute a calculation whose scaling is much better, but that would take a few hours in sequential, using a provided input file. For the last section of that part, you would be better off having access to more than 100 computing cores, although you might also change the input parameters to adjust to the machine you have at hand. For the other parts of the tutorial, a 16-computing-core machine is recommended, in order to perform the scalability measurements. You are supposed to know already some basics of parallelism in ABINIT, explained in the tutorial A first introduction to ABINIT in parallel. This tutorial should take less than two hours to be done if a powerful parallel computer is available. 1.1. 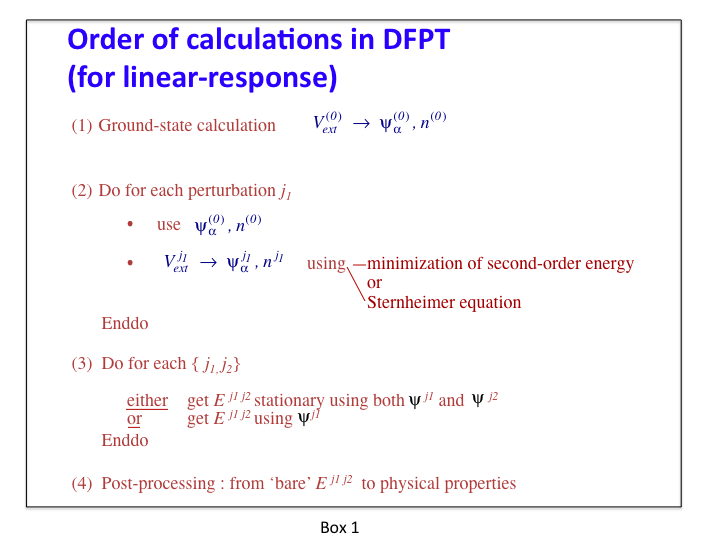 Let us recall first the basic structure of typical DFPT calculations summarized in box 1. The step 1 is done in a preliminary ground-state calculation (either by an independent run, or by computing them using an earlier dataset before the DFPT calculation). The parallelisation of this step is examined in a separate tutorial. The step 2 and step 3 are the time-consuming DFPT steps, to which the present tutorial is dedicated, and for which the implementation of the parallelism will be explained. They generate different files, and in particular, one (or several) DDB file(s). As explained in related tutorials (see e.g. 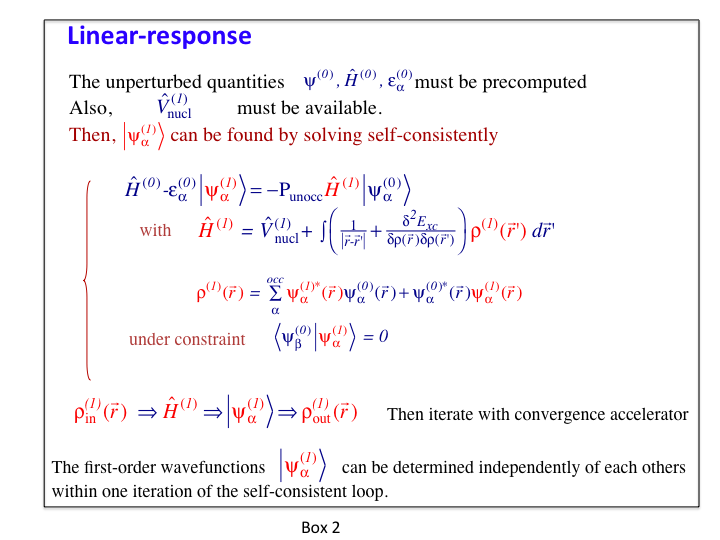 Response-Function 1), several perturbations are usually treated in one dataset (hence the “Do for each perturbation”-loop in step 2 of this Schema). For example, in one dataset, although one considers only one phonon wavevector, all the primitive atomic displacements for this wavevector (as determined by the symmetries) can be treated in turn. The step 4 refers to MRGDDB and ANADDB post-processing of the DDB generated by steps 2 and 3. These are not time-consuming sections. No parallelism is needed. 1.2. 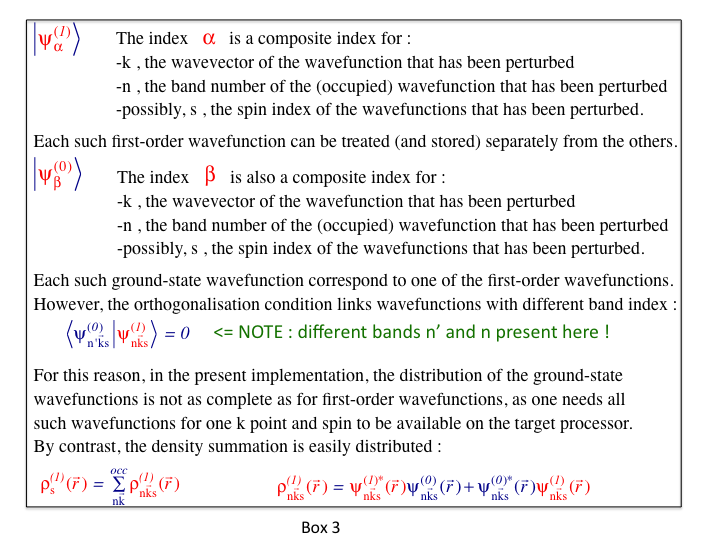 The equations to be considered for the computation of the first-order wavefunctions and potentials (step 2 of box 1), which is the really time-consuming part of any DFPT calculation, are presented in box 2. The parallelism currently implemented for the DFPT part of ABINIT is based on the parallel distribution of the most important arrays: the set of first-order and ground-state wavefunctions. While each such wavefunction is stored completely in the memory linked to one computing core (there is no splitting of different parts of one wavefunction between different computing cores - neither in real space nor in reciprocal space), different such wavefunctions might be distributed over different computing cores. This easily achieves a combined k point, spin and band index parallelism, as explained in box 3. 1.3. The parallelism over k points, band index and spin for the set of wavefunctions is implemented in all relevant steps, except for the reading (initialisation) of the ground-state wavefunctions (from an external file). Thus, the most CPU time-consuming parts of the DFPT computations are parallelized. computing the first-order change of potential from the first-order density, and similar operations that do not depend on the bands or k points. In the case of small systems, the maximum achievable speed-up will be limited by the input of the set of ground-state wavefunctions. For medium to large systems, the maximum achievable speed-up will be determined by the operations that do not depend on the k point and band indices. Finally, the distribution of the set of ground-state wavefunctions to the computing cores that need them is partly parallelized, as no parallelism over bands can be exploited. Before continuing you might work in a different subdirectory as for the other tutorials. Why not work_paral_dfpt? We start by treating the case of a small systems, namely FCC aluminum, for which there is only one atom per unit cell. Of course, many k points are needed. 2.1. The first step is the pre-computation of the ground state wavefunctions. This is driven by the files tdfpt_01.files (and tdfpt_01.in). You should edit them and examine them. A reference output file is available in $ABI_TUTOPARAL/Refs, under the name tdfpt_01.out. It was obtained using 4 computing cores, and took a few seconds. 2.2. The second step is the DFPT calculation, for which the files are tdfpt_02.files (and tdfpt_02.in). There are three perturbations (three atomic displacements). For the two first perturbations, no symmetry can be used, while for the third, two symmetries can be used to reduce the number of k points to 1024. Hence, for the perfectly scalable sections of the code, the maximum speed up is 5120 (=1024 k points * 5 bands), if you have access to 5120 computing cores. However, the sequential parts of the code dominate at a much, much lower value. Indeed, the sequential parts is actually a few percents of the code on one processor, depending on the machine you run. The speed-up might saturate beyond 4 and 8 (depending on the machine). .Delivered    0 WARNINGs and   3 COMMENTs to log file. 2.3. Because this test case is quite fast, you should play a bit with it. In particular, run it several times, with an increasing number of computing cores (let’s say, up to 32 computing cores, at which stage you should have obtained a saturation of the speed-up). You should be able to obtain the following. It is made of two groups of data. The first one corresponds to the analysis of the timing for the computing core (node) number 0. The second one is the sum over all computing cores of the data of the first group. Note that there is a factor of four between these two groups, reflecting that the load balance is good. Let’s examine the second group of data in more detail. It corresponds to a decomposition of the most time-consuming parts of the code. Note that the subtotal is 98.9 percent, thus the statistics is quite good. Without going into the detail of each routine, for the present purpose, the most significant information is that among all the timed sections of the code, only “inwffil” and “vtorho3:synchro” will not benefit from parallelism. “inwffil” is a subroutine whose job is to read the ground-state wavefunctions (you can find the source of the “inwffil” routine on GitHub or on the ABINIT Web site). As mentioned in the section 1, the reading of the ground-state wavefunctions is not done in parallel in the case of the DFPT computations (note that the reading is actually parallelized for e.g. ground-state calculations). In the output file provided as a reference (with four computing cores), the “inwffil” wall clock time is 7.387 seconds, on a total of 48.211 secs. By increasing the number of computing cores, it will be possible to decrease the total time, but not below the value of 7.387 seconds in any case. You should observe a similar behaviour with your own tests. 3.1. This test, with 29 atoms, is slower, but scales better than the Al FCC case. It consists in the computation of one perturbation at qpt 0.0 0.25 0.0 for a 29 atom slab of barium titanate, artificially terminated by a double TiO2 layer on each face, with a reasonable k-point sampling of the Brillouin zone. The symmetry of the system and perturbation will allow to decrease this sampling to one quarter of the Brillouin zone. E.g. with the k-point sampling ngkpt 4 4 1, there will be actually 4 k-points in the irreducible Brillouin zone for the Ground state calculations. For the DFPT case, only one symmetry will survive, so that, after the calculation of the frozen-wavefunction part (for which no symmetry is used), the self-consistent part will be done with 8 k points in the corresponding irreducible Brillouin zone. With the sampling 8 8 1, there will be 32 k points in the irreducible Brillouin zone for the DFPT case. There are 120 bands. Note that the value of ecut that is used in the present tutorial is too low to obtain physical results (it should be around 40 Hartree). As in the previous case, a preparatory ground-state calculation is needed. The input files are provided, in the directory $ABI_TUTOPARAL/Input. The preparatory step is governed by tdfpt_03.files (and tdfpt_03.in). The real (=DFPT) test case is governed by tdfpt_04.files (and tdfpt_04.in). The reference output files are present in $ABI_TUTOPARAL/Refs: tdfpt_0324.out and tdfpt_0432.out. The naming convention is such that the number of cores used to run them is added after the name of the test: the tdfpt_03.in file was run with 24 cores, while the tdfpt_04.in was run with 32 cores. The preparatory step took about 5 minutes, and the DFPT step took about 5 minutes as well. Now, examine the obtained output file for test 04, especially the timing. You will notice that the sum of the major independent code sections is again very close to 100%. You might now explore the behaviour of the CPU time for different numbers of compute cores (consider values below and above 32 processors). Some time-consuming routines will benefit from the parallelism, some other will not. The kpoint + band parallelism will efficiently work for many important sections of the code: projbd, fourwf%(pot), nonlop(apply), fourwf%(G->r). In this test, the product nkpt (the effective number of k points for the current perturbation) times nband is 8*120=960. Of course, the total speed-up will saturate well below this value, as there are some non-parallelized sections of the code. In the above-mentioned list, the kpoint+band parallelism cannot be exploited (or is badly exploited) in several sections of the code : “vtorho3:synchro”, about 5 percents of the total time of the run on 32 processors, “newkpt(excl.rwwf)”, about 2 percents, vtowfk3(contrib), about 1.5 percent, “pspini”, about 1 percent. This amounts to about 10% of the total, and, according to Amdahl’s law, the saturation will happen soon, with less than 100 processors. 3.2. A better parallelism can be seen if the number of k-points is brought back to a converged value (8x8x1). Try this if you have more than 100 processors at hand. and launch again the preliminary step, then the DFPT step. Then, you can practice the DFPT calculation by varying the number of computing cores. For the latter, you could even consider varying the number of self-consistent iterations to see the initialisation effects (small value of nstep), or target a value giving converged results (nstep 50 instead of nstep 18). The energy cut-off might also be increased (e.g. ecut 40 Hartree gives a much better value). 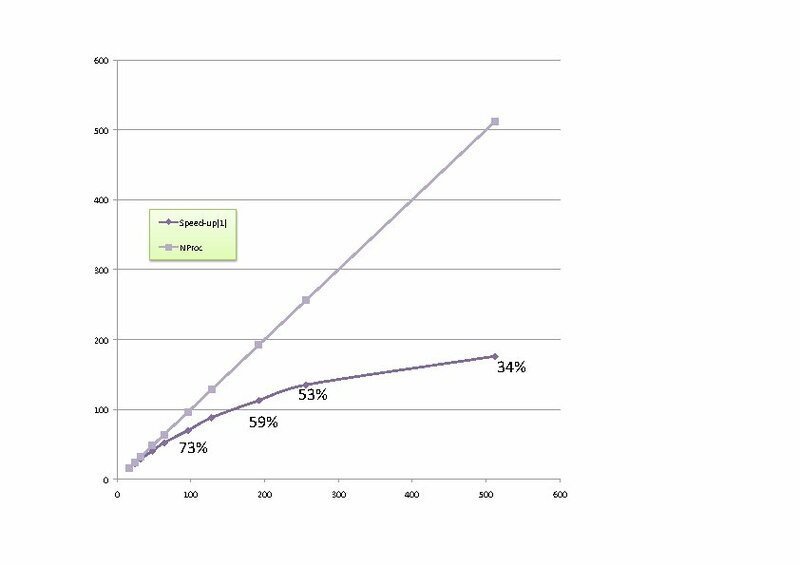 Indeed, with a large value of k points, and large value of nstep, you should be able to obtain a speed-up of more than one hundred for the DFPT calculation, when compared to a sequential run (see below). Keep track of the time for each computing core number, to observe the scaling. The next figure presents the speed-up of a typical calculation with increasing number of computing cores (also, the efficiency of the calculation). Beyond 300 computing cores, the sequential parts of the code start to dominate. With more realistic computing parameters (ecut 40), they dominate only beyond 600 processors. This last example is the end of the present tutorial. You have been explained the basics of the current implementation of the parallelism for the DFPT part of ABINIT, then you have explored two test cases: one for a small cell materials, with lots of k points, and another one, medium-size, in which the k point and band parallelism can be used efficiently even for more than one hundred computing cores.